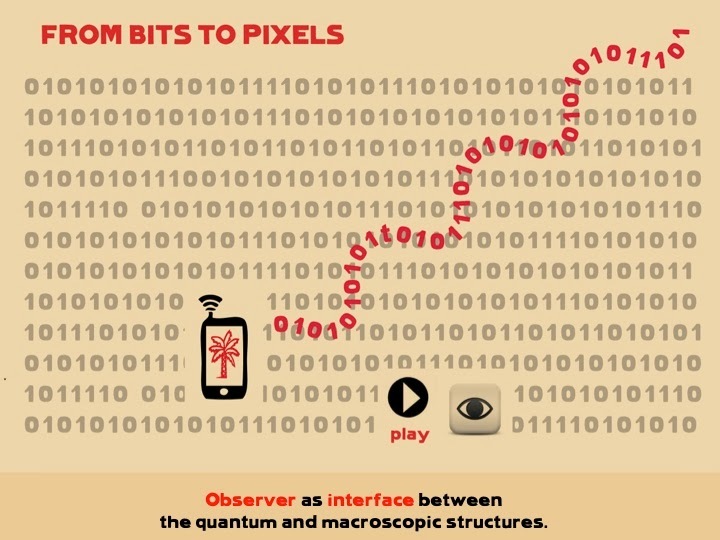 Quantum Filmmaking: The Cinema that Transforms Reality. [Paper presented at MINA 2013 > 3rd International Creativity and Innovation Mobile Symposium (Auckland, New Zealand) on 22 November 2013]. According to the Oxford English Online Thesaurus, the terms ‘observer’ and ‘participant’ are antonyms. Through her experimental research projects Kino-Present <www.kino-present.org.uk> and Now&Here=Everywhere <www.now-here-everywhere.org.uk>, the researcher explores the role of the observer as active agent in the construction of participatory video-collages building upon the medium specificity of contemporary mobile social media, such as, ubiquity, connectivity, and mobility, which enables the participation of anyone, anywhere, anytime in the present tense, and whose outcomes are unpredictable. When approaching the analysis of participatory video-collage happening dialectically between the ON and OFF line realms, we are facing the epistemological problem of having to find a suitable methodology. For this reason, the researcher uses an interdisciplinary approach focused from the Quantum Mechanics perspective, theory inspired by Cubist Collage itself (Miller 2000), which for the first time in History includes the subjectivity of the experimenter within the experiment, claiming that “the reality varies, depending upon whether we observe it or not” (Heisenberg, 1958), with the consequent connotation that the observer changes reality. These revolutionary scientific theories provoked a paradigm shift that would influence politically the American post World War II society and, therefore, the evolution of the avant-gardes and the ontology of Expanded Cinema, manifested in the production of multi-screen collages (VanDerBeek 1963) and participatory telecommunication projects (Whitman 1972), engaging observers in the process of production of the artworks, in order to produce critical awareness and “expand consciousness” (Youngblood 1970). The previous historical, theoretical and empirical premises synthesize into Quantum Filmmaking, which remarks the action of making films in the present tense, highlighting the performativity aspect of the role of the observer during the process of constructing the video-collages, interacting with the OFF and ON line realms: with the micro cameras incorporated in the smartphones they articulate while filming the flowing of events, creating situations in the everyday life, and on the other hand, physically editing the videos online. On the other hand, in participatory and behaviorist art a feedback loop is established, that acts as “a catalyst which sets up [new] patterns of behavior”, that eventually would be reflected in the interaction of the participants with their environments (Ascott 1967). These arguments lead us to conclude that if Expanded Cinema in the 1960-70s was intended to expand consciousness in society, within the context of contemporary mobile social media, due to their ubiquity, Quantum Filmmaking stresses the agency of the observers to transform it. During the course of this paper we will be exposing the ontological, epistemological and empirical premises that have given rise to the interdisciplinary participatory practice Quantum Filmmaking, which stands for the production of participatory video-collages building upon the medium specificity of contemporary video mobile phones and mobile social media, such as, ubiquity, connectivity, and mobility, which enables the participation of anyone, anywhere, anytime, in the present tense, and whose outcomes are unpredictable. First of all, we will be introducing the experimental projects Kino-Present <www.kino-present.org.uk> and Now&Here=Everywhere <www.now-here-everywhere.org.uk>, which provide the framework to analyze the quantum ontology of the ON/OFF line production of participatory video- collages. 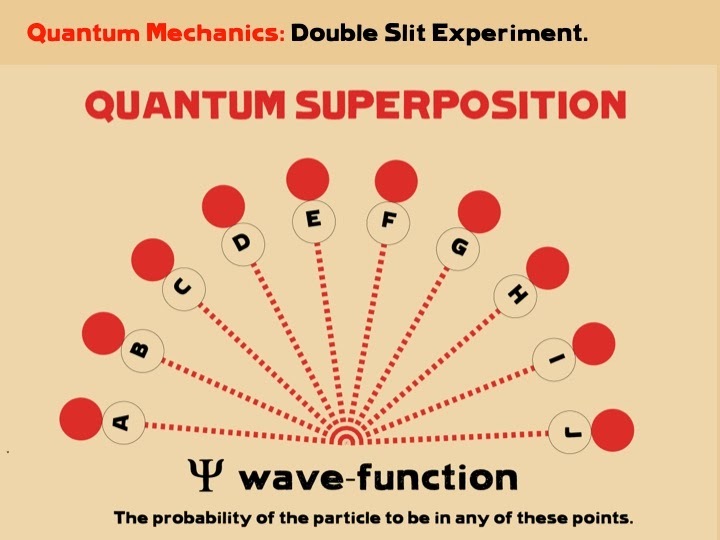 After, we will be exposing the main theories in Quantum Physics that inform ontologically and epistemologically the experimental research, such as, the outcomes of the Double Slit Experiment and The Copenhagen Interpretation of Quantum Mechanics (1924-7). And finally, we will analyze the impact of Quantum Physics in American Post World War II avant-gardes that shed light to Expanded Cinema as collage practice, and subsequently, would synthesize into Quantum Filmmaking within the contemporary mobile social media context. 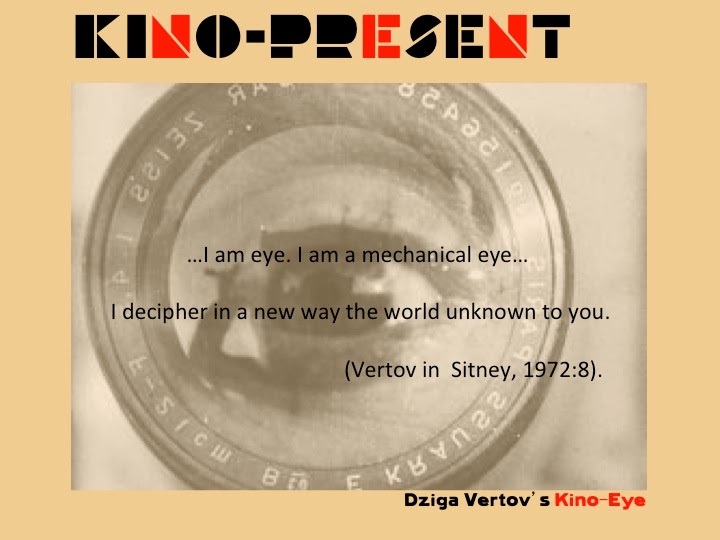 Dziga Vertov, soviet filmmaker from the 1920s, pioneer in avant-garde cinema, in the Provisional Instructions to Kino-Eye Groups (1926) establishes an interesting analogy between the film camera and the microscope, stating that if the microscope was invented to see invisible phenomena, “the cine camera serves to penetrate more deeply into the visible world”. (Vertov in Fowler, 2002:34). In 1929, Vertov directed The Man With the Movie Camera, presenting a day in the life of the proletarians from the Ukrainian cities Odessa, Kharkiv and Kiev. In this documentary the director experiments with a range of cinematic techniques, such as, double exposure and fast/slow motion. Throughout the film, Vertov explores the Film-within-Film structure, linking the actual screen action of the documentary with its own film strip in the cutting room, where the editor, Vertov’s wife Elizaveta Svilova, is editing it. At the end of the day, the proletarians go to cinema to watch the film we are currently viewing, in which they are also the ‘leading characters’. Kino-Present <www.kino-present.org.uk> is a XXI Century digital interpretation of The Man With The Movie Camera, reversing and synthesizing the ontological order of production and reception of traditional cinema, in which participants co-create film collages building upon contemporary domestic social media, Bluetooth and mobile technologies. The single-screen video collages created throughout the Kino-Present process are the final trace, the documentary record of the dialectics between the different levels of participation in the OFF and ON line realms: Firstly, participants send the researcher fifteen-second video clips. These, are broadcasted in the public domain via Bluetooth to the mobile phones of the general public, creating ephemeral mobile cinemas. After, they are uploaded onto the website from their mobile phones, so they can be edited online, in order to create new video collages. On the other hand, Now&Here=Everywhere <www.now-here-everywhere.org.uk> is an international participatory multi-screen video collage project, co-creating and re-creating simultaneous moments while celebrating cultural diversity, in which everybody is invited to collaborate with their mobile phones. The documentary art project invites participants to make a thirty-second film with their smart phones at certain date and time, which are sent back straight away to the researcher via e-mail and WhatsApp, and then published onto the Gallery of Moments of the website. These collage-moments are random generated every time the observers interact with them. For the scope of this document, we are going to focus on the key concepts of Quantum Mechanics that will be applied for the analysis of the experimental projects, such as quantum indeterminacy, Ψ- function or wave-function, wave-particle duality, and wave-function collapse. Quantum Mechanics is a science that a priori can sound counterintuitive. The Double-Slit Experiment, Young 1802 & Jönsson 1961, was analyzed by Bohr assisted by Heisenberg in The Copenhagen Interpretation of Quantum Mechanics (1924-7). At that time, Bohr was very impressed about the multi-perspectivism of Cubist Art, because it represents a scene as if the observer is “moving around an object [in order to] seize it from several successive appearances...” freeing the artist from a single perspective point in favor of multiple viewpoints. (Miller, 2000:396). Thus, he developed the Principle of Complementarity in Quantum Mechanics (1927) in which he establishes the principle of wave-particle duality, as an electron can behave both as a wave and as a particle, but not both at the same time, asserting they are complementary faces of a single reality, in which the observer needs to choose which quality to observe. 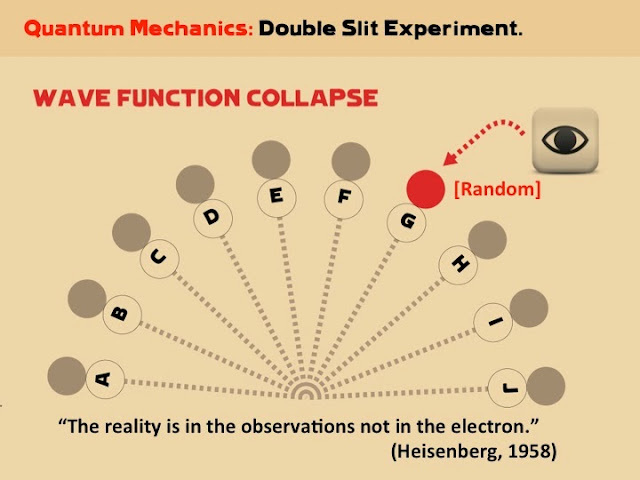 The Double Slit Experiment demonstrates physically, the phenomenon of wave-function collapse in which the wave-function (Ψ = psi) or the probability of a photon/electron of being at any particular place, is in quantum superposition collapsing through the action of measuring by the observer, which transforms the quantum wave into particle, and thus takes randomly a definite position within the system. The Copenhagen Interpretation of Quantum Mechanics is a very revolutionary shift in Physics and sciences in general: it is the first time that the scientist is taken into account within a scientific experiment: “The reality is in the observations, not in the electron”. (Heisenberg, 1958:XII). 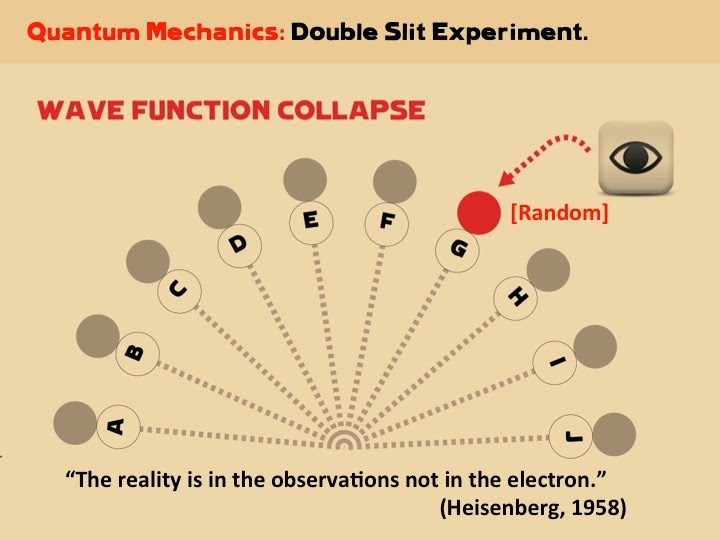 The act observation in Quantum Physics plays a decisive role in the experiment as “the reality varies, depending upon whether we observe it or not” (Heisenberg, 1958:20), with the consequent connotation that the observer changes reality. If during the 1920s the evolution of Surrealism was epistemologically influenced by Quantum Physics, the Hiroshima and Nagasaki atomic bombing catastrophes (1945) generated a general rejection of the Surrealist group against nuclear physics, to such a extent that in 1952, Breton during the course of an interview demonstrates his visceral rejection to atomic physics, asserting that artists had “unanimously... been uninterested in quantum mechanics and Heisenbergian physics”. Also, when referring to scientists, Breton quotes the German Romantic Georg Christoph Lichtenberg, claiming sardonically “what more could we say about atomic scientists? (...) Their heads are most often filled with junk”. (Parkinson, 2008:213-4). This rejection would continue in posterior generations of avant-garde artists in the 1950-60s such as John Cage, whose Fluxus practice is conceptually influenced by Quantum Theory, but possibly due to his dadaist rejection to war and nuclear weapons, the artist eludes any kind of theoretical connection to it. Danvers (2006:313) cites Cage making reference to Aquinas’ dictum claiming he is interested in making and discussing a kind of art “that imitates nature in her manner of operation”. This claim is very interesting because albeit Cage does not make any direct reference to Quantum Theory, it resembles that he is aware of the recent discoveries in regards of the unpredictable and uncontrollable behavior of the subatomic particles in the inner reality. Is he imitating sub-atomic nature in its manner of operation? Cage follows the same procedure as Bohr and Heisenberg devised in the Copenhagen Interpretation of Quantum Mechanics, letting chance to make the stylistic choices through the operations of the I Ching, in such way that all the possibilities of the wave-function of the music score were randomly reduced to one. One of the major social changes introduced by the Sixties that contributed to expand cinema, was the standardization of the TV in American homes, which mirrored the unfair state of the world. This provoked social upheavals in the American counter-cultures, generating a non-mimetic Cubist treatment of the medium, due to their rejection to reality and mainstream cinema as a tool of Capitalism for mass deception. 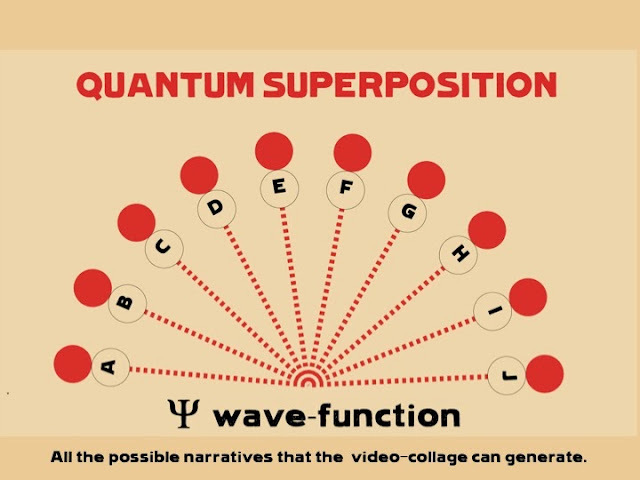 On the other hand, the latest discoveries in Quantum Physics emphasized the agency of the observers in changing reality, while questioning its innermost nature in terms of matter, light, space and time, or in other words: the paradigms of cinema. This was manifested deconstructing the medium by expanding it in space in the form of multiscreen collages, e.g. Stan VanDerBeek’s Movie-Drome (1963-66), expanding it in time into the present tense through performance, and encouraging observer’s participation in telecommunication projects, such as as Robert Whitman’s Telephony Performances (1972-2012). Since its early days, Expanded Cinema as artistic phenomenon has been reluctant to be defined under the ontological spell and effects of quantum indeterminacy, with a Ψ-function ranging from cinema, to performance, collage, participation, synaesthesia, semi-immersion, cybernetics and intercommunication, coexisting in superposition. 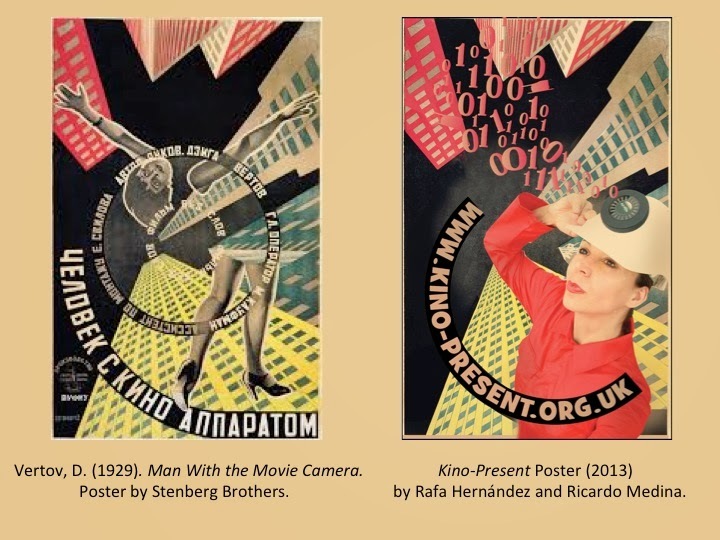 Expanded cinema artists defended the discourse of the autonomy of cinema as art rejecting narrative and exploring its medium specificity, recovering the values of Dziga Vertov who in 1922 claimed “Film drama is the opium of the masses”. They rejected Aristotle’s cathartic linear narrative, dominant in mainstream cinema, because they found it “manipulatory, mystificatory, repressive” (Gidal, 1976). It was a cinema intended to “expand consciousness” (Youngblood, 1970:75). 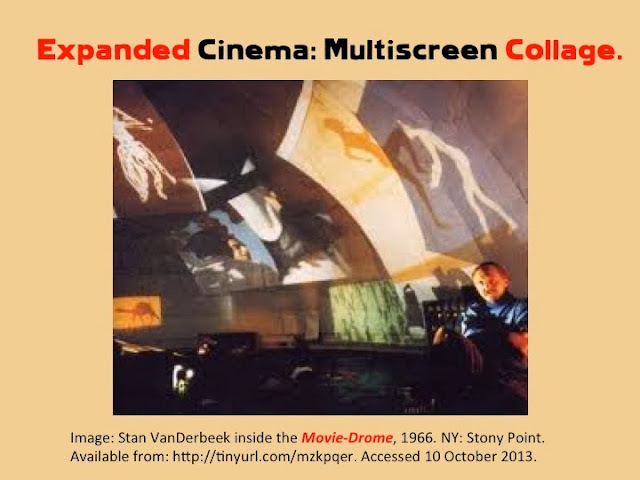 The first multiscreen film-collage was created by Stan VanDerbeek while living in the artistic commune of Stony Point in New York with John Cage and Merce Cunnigham, his former tutors from Black Mountain College in North Carolina. In this artistic environment and influenced by the quantum indeterminacy of his mentors, VanDerBeek starts working on his Movie-Drome theater (1963-66), expanding spatially in multiple screens the iconoclast collage animations he had been working on up to that moment at the Bells Labs. In 1965 VanDerBeek writes the Culture: Intercom and Expanded Cinema Manifesto, in which he shares “a vision concerning the immediate use of motion pictures or expanded cinema as tool for world communication”, devising the Internet as we know it nowadays. (Curtis et al. 2011:80-84). Other manifestations of the influence of Quantum Physics would be in participatory telecommunication projects, such as, the work of Robert Whitman News (1972), in which participants were allocated a payphone in Manhattan and called him describing their location, while being broadcasted live over the radio station WBAI in New York City. In 2012, Whitman performed Local Report, which was an international media and telecommunications work in which the artist mixed live video and audio reports from approximately ninety participants around the world, composing what he calls “a cultural map of the world”. According to the International Telecommunications Union in 2013 there is an estimated of 77% of Internet users in post-industrial societies that access the web through fixed and mobile broadband: We are literally surrounded by sequential waveforms of invisibles zeros and ones waiting to be collapsed and transformed into moving images by the observers with a mobile phone or a computer. Then, they transform into multi-spatial, multi-temporal and multi-textual narratives, depending on the space and time of the production and reception, and as in the microscopic universe, they can be simultaneously in more than one place at the time. Quantum Filmmaking remarks the action of making video-collages in the present tense, highlighting the performative aspect of the role of the observer as live art during the process, interacting with the OFF and ON line realms, and duplicating the third region of time/space experience in Expanded Cinema devised by Le Grice (Curtis, 2007:228), during the (im)material processes of production and reception. “Each film is a record (not a representation, not a reproduction) of its own making” (Gidal 1976). 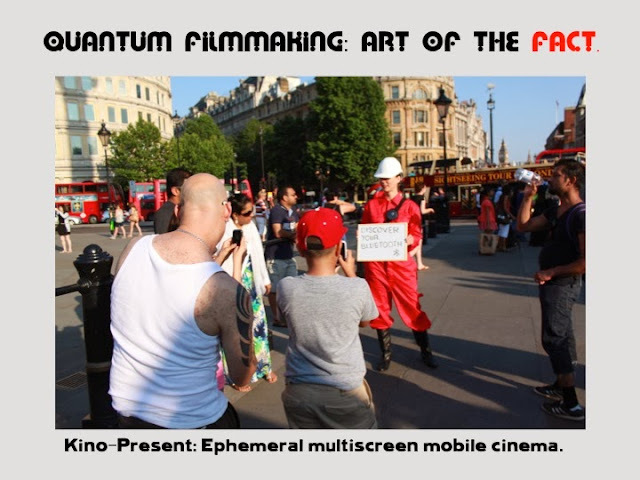 Quantum Filmmaking is the art of the fact: the collages created through this process are the documentary record, the trace of the activities that have taken place in the virtual, private and public realms. It is the cinema that literally transforms reality: while the observers interact physically with the projects they generate new situations in reality, and on the other hand, the experience of participation may generate new patterns of behavior in them (Ascott 1967). 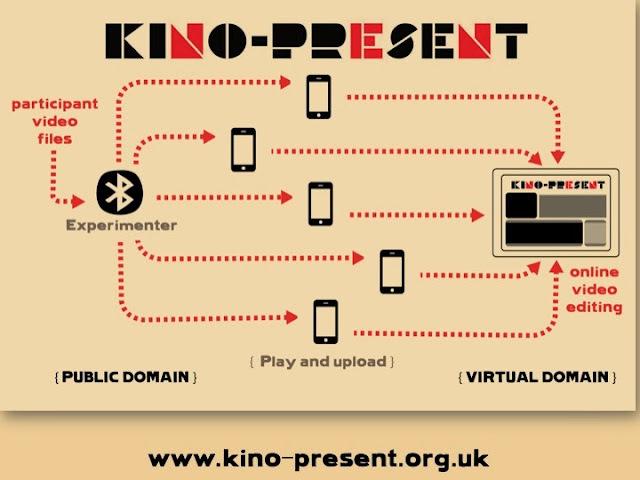 As example, during the interventions in the public domain of Kino-Present, we create ephemeral multi-screen mobile cinemas, while the observers receive the fifteen-second video-files via Bluetooth in their mobile phones. On the other hand, in the project Now&Here=Everywhere the observers perform in present continuous the action of filming with their mobile phones, framing and recording a portion of their reality, collapsing all the possible angles of it into one single thirty-second take, creating OFF screen situations and choreographies in their everyday lives. Quantum Filmmaking is the art of the probabilities and possibilities in which, as organic process, the artwork emerges during the development. There is not a definite outcome, since the system varies and changes every time the observers interact with it, and as in Quantum Mechanics, these variations are unpredictable: In Kino-Present, the form of the collages edited online depends on the wave-function or subjectivity of the observer who performs the editing, whereas in Now&Here=Everywhere the multi- screen collages are random generated by a computer algorithm, every time the observers log into the website or refresh it. A quantum narrative is collapsed by the encounter between all the possible interpretations of the video-collage, the subjectivity of the observer and the circumstances of the encounter, which will affect the wave-functions of the video collage and the observer. This is very important, because the experience of the video collage would be different if you watch it, for instance, at home in a computer, or projected onto a screen in a public space. 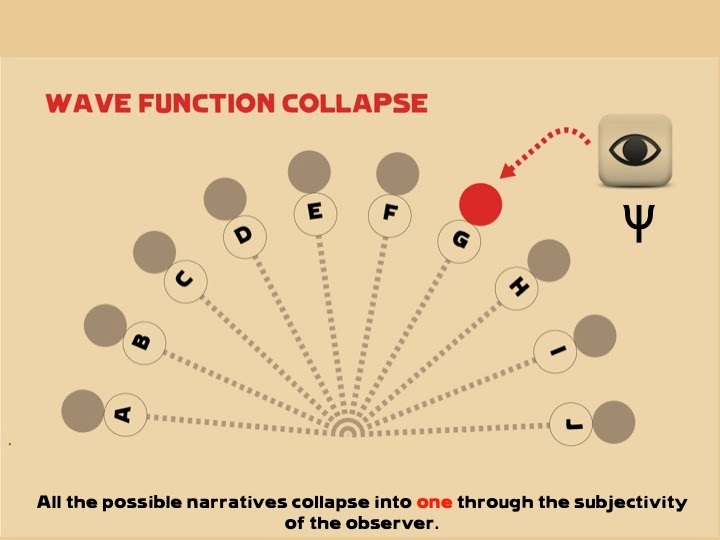 Quantum narratives can be considered chance narratives because the combination of these factors is aleatory. The participatory single screen collages created in Kino-Present are time-based but they are not chronological, since there is not an exposition of events. There is a before and an after, but since the different collated fragments are unrelated, the most important time paradigm is now, in the present tense. These multi-authored collages are inherently multi-textual, with meaning arising from the dialogue or collision between the different fragments. These collages can be phenomenological or synesthetic narratives, experienced as visual music, whose multiple narrative fields co-existing in superposition, collapse into one reading and/or experience through the intervention of the subjectivity of the observers. And every observer has a different reading or experience. The multi-screen collages from Now&Here=Everywhere re-creating simultaneous moments are configured every time the observers log into the website or refresh it, and like in the quantum universe, all the possible configurations coexist in superposition collapsing into one when interacting with the observer. Sound plays a very important role in the project, blending and collating the sometimes antagonistic micro-narratives of each moment, where synergically, the whole narrative experience created is greater than the sum of the individual contributions. Apart from the ON and OFF line physical transformations, Roy Ascott (1967) asserts that in participatory and behaviorist art a feedback loop is established, that acts as “a catalyst which sets up [new] patterns of behavior”, that eventually would be reflected in the interaction of the observer with their environments. This Romantic vision is influenced by the work of Novalis, Romantic Philosopher and poet, who in 1798 writes Notes for a Romantic Encyclopedia. In this unfinished and fragmented masterpiece, he expounds on his conception of Magical Idealism postulating that the world of nature can be transformed at will by the artist with imagination: “Every person is the seed of an infinite genius” (Entry 63, 2007:10). According to Duncan White (2010:93) technology, media and culture begun to permeate when TV acquired value and social status as ‘live’ medium in the late 1960s, especially during the broadcasting of the landing of the Apollo 11 on the moon. Nowadays, the technological evolution of the contemporary smartphones and their standardization in the daily life of post-industrial societies has produced the synthesis of technology, media and culture, provoking a socio-cultural paradigm shift which subverts the unidirectional ontology of the mass media and the cinematic apparatus: potential audiences of traditional cinema have now instant access, anytime and anywhere, to the tools of film production, distribution and exhibition. This paradigm shift fosters a creative, and therefore critical, approach of the subjects to reality leading us to conclude that if Expanded Cinema in the 1960-70s was intended to expand consciousness in society, Quantum Filmmaking stresses the agency of the observers to transform it. © iceberg Fernandez -University of the Arts London- 2013. -Fernandez et al. (2011- Ongoing). Kino-Present. [Internet: Website]. Available from: <www.kino-present.org.uk>. [Last accessed 17 October 2013]. -Fernandez et al. (2011- Ongoing). 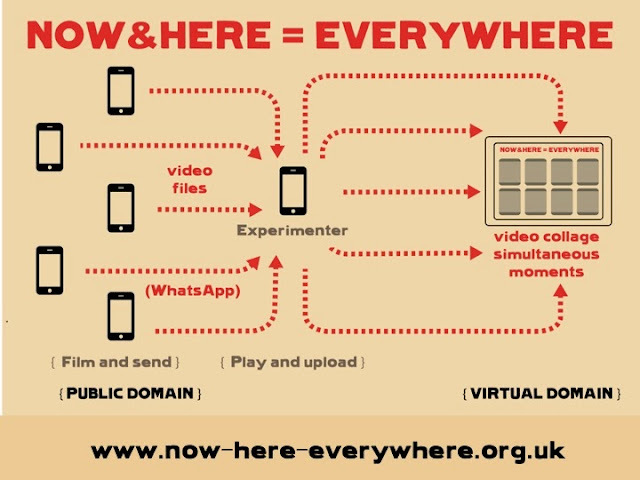 Now&Here=Everywhere. [Internet: Website]. Available from: <www.now-here-everywhere.org.uk >. [Last accessed 17 October 2013]. -VanDerBeek, S. (1963-66). Movie-Drome Theatre. N.Y: Stony Point. -Vertov, D.  (2008). The Man with a Movie Camera. [DVD]. London: BFI. -Ascott, R. . Behaviourist Art and the Cybernetic Vision. In Multimedia: From Wagner to Virtual Reality. (2002). London: W. W. Norton & Company. Pp. 104-120. -Curtis, D. (2007). History of Artists’ Film and Video in Britain. London: BFI. -Curtis et al. (2011). Expanded Cinema: Art, Performance, Film. London: Tate. -Danvers, J. (2006). Picturing Mind: Indeterminacy and Consciousness in Art and Poetry. Amsterdam: Rodopi, B.V Ed. -Gidal, P .Theory and Definition of Structural/ Materialist Film in Introductory Essay to the Structural Film Anthology, Published by the BFi. [Internet]. Available from: <http://tinyurl.com/m7ck9s2> [Last accessed 17 October 2013]. -Heisenberg, W. (1989). Physics and Philosophy: The Revolution in Modern Science. UK: Penguin. -Novalis. .(2007). Notes for a Romantic Encyclopaedia. Translated, Edited, and with an Introduction by David W. Wood. NY: UP. -Miller, Arthur I. (2000). Insights of Genius: Imagery and Creativity in Science and Art. London: MIT. -Parkinson, G. (2008). Surrealism, Art and Modern Science. New Have & London: Yale UP. -Shaw, J & Weibel, P. (2003). Future Cinema: The Cinematic Imaginary After Film. Cambridge: The MIT press. -Vertov, D . .(2002).Provisional Instructions to Kino-Eye Group. In C. Fowler (ed.) The European Cinema Reader. (2002). London: Routledge. -White, D. (2010). British Expanded Cinema and the ‘Live Culture’ 1969–79. In: Visual Culture in Britain. London: Routledge. Pp 93-108. -Youngblood, G. (1970). Expanded Cinema. NY: Dutton.